If you are the kind who enjoys your trip to the bustling fish markets, stop reading now. But if you would love a fish curry for lunch without the hassle of that trip, Bradleya��s Seafood has just the thing for you. a�?We realised that there are a lot of people who would have seafood more regularly if they did not have to go to the market themselves,a�? says Ramesh Subramaniam, one of the partners behind the month-old venture that delivers fresh catch from as early as 8.30 am. The mechanical engineer, along with his partner Victor Praveen Raj, are fully aware that there are others who offer the same service. a�?But we dona��t do any cold storage,a�? Subramaniam points out, adding, a�?We procure only based on requirement, so there is absolutely no storing involved.a�? Of course, this means you will have to place your orders the previous day, but thata��s something customers dona��t mind, especially when their seafood arrives fresh, in vacuum packed low density polyethylene covers. Still not convinced? Perhaps you will be when you hear that in addition to offering slices, fillets and barbecue cuts (cleaned and whole for the griller), Bradleya��s also obliges with some tried and tested Indian recipes, should you be new to cooking seafood. Given the health benefits (read protein content), a lot of people are switching or taking up seafood and Raja��s wife has just the right recipes. 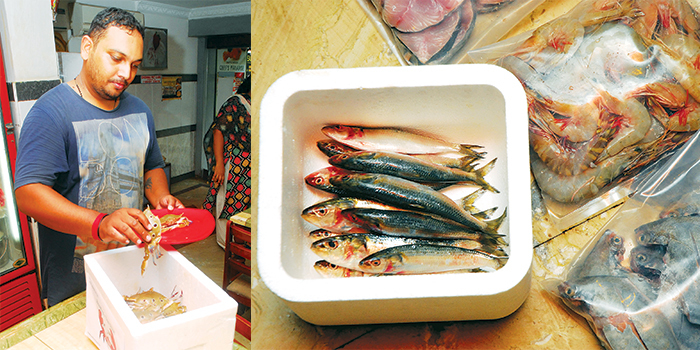 a�?In Chennai, seer fish and snapper are preferred by many,a�? Subramaniam says, while Raj adds that though they do not procure frozen fish (like salmon that is usually imported) they keep customers posted on seasonal or rare catches like lobster and yellow fin tuna. And while crabs, squid and octopus are also among the common catch, Raj advises that you let them know if youa��re interested in the soft shell crabs that come in once or twice a week and the even rarer red sea crabs that are much larger and only surface during a storm. They are just wonderful…..fresh catch came home…. I guess , everyone should try this out….. As they promise.. they deliver fresh sea foods on time….